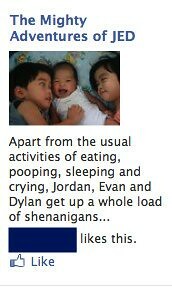 Our Facebook feeds have been inundated with our friends and their families going on fun and exotic holidays. We aren't embarking on one since we did the Great Epic Adventure last year and are still recovering from it, economically and otherwise. Anyway, holidays are fun even in town because it means we actually have time to do stuff. I think primary school has made us all appreciate the non-school time more so we have done things we wouldn't normally do. In the last two weeks, we've messed about in the elements and taken the kids out of their comfort zones. 1. The twins took me running. They wouldn't run. I wanted to run so I had vehicular escorts in the form of bikes and scooters. The escorts need to be stronger though. 3 km back and forth winded them badly; they ran out of breath and they were drenched. After that hour, we all felt broiled and a little bit burned. 2. 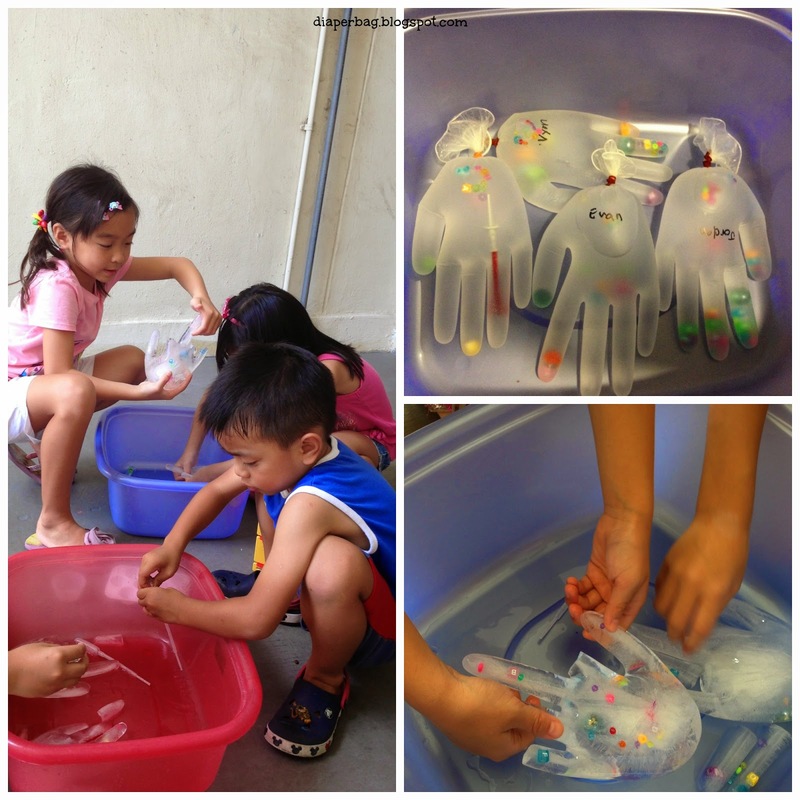 We found this activity to fulfil Jordan's Elsa imaginations and with her friend over on a playdate, they had a lot of fun thawing out the frozen hands with pipettes, salt, warm water and all other means of either retarding or accelerating the melting of the ice. To make it girly, I put in beads and gems we could had lying around the house. JED ran round like headless chickens looking for stuff to put into the gloves and had a grand time filling the glove just right, without bursting them. I think the most thrilling bit was when Elsa's fingers broke off and JED got vindictive and started forcibly yanking off her fingers! They didn't like it when their fingers got so frosty cold that even tap water felt warm to them. The ridiculously hot and humid weather made me relax the junk food laws in the house. 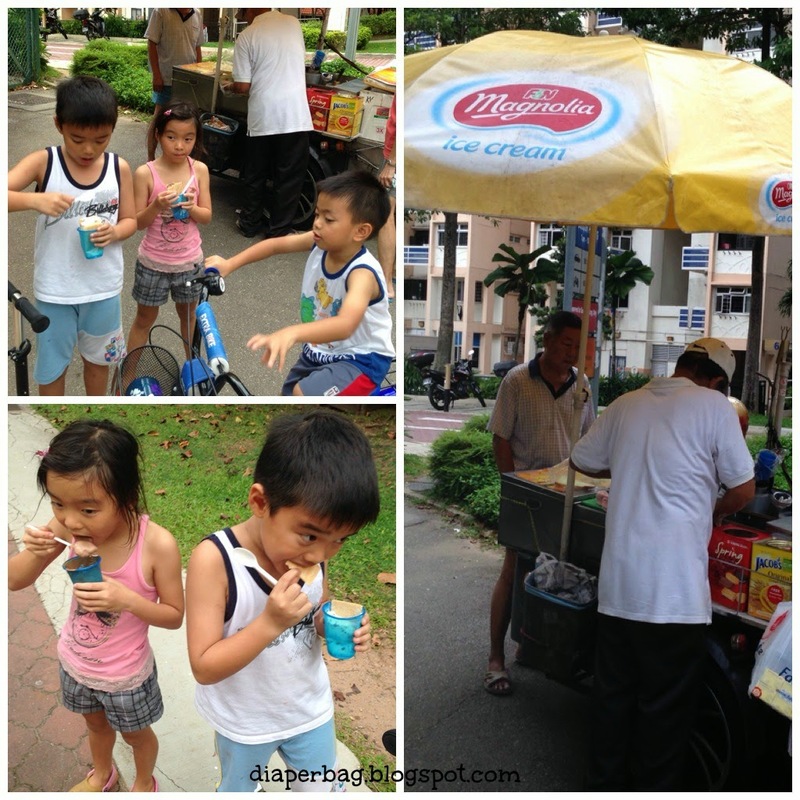 We went a-hunting for the ice cream man that frequents our estate. It brought back a whole lot of memories about waiting for the ice cream man and his bell and also of the ice cream man at the school gates after school. The kids couldn't understand the concept of needing to find the ice cream man or to wait for the ice cream man to come round to be able to have the ice cream. It took about 45 minutes for the guy to appear. Anyway, blocks of ice cream between two wafer biscuits; in a cup just because the twins are messy eaters, were a hit with the twins. They stood by the side of the road, stooped or sat on the kerb, all the fun for $2. No Ben and Jerry's or Haagen Daaz in sight for them. For some reason, JED think night walks are da' bomb. Possibly because their bedtimes are so early, they never really have the opportunity to be out in the dark. 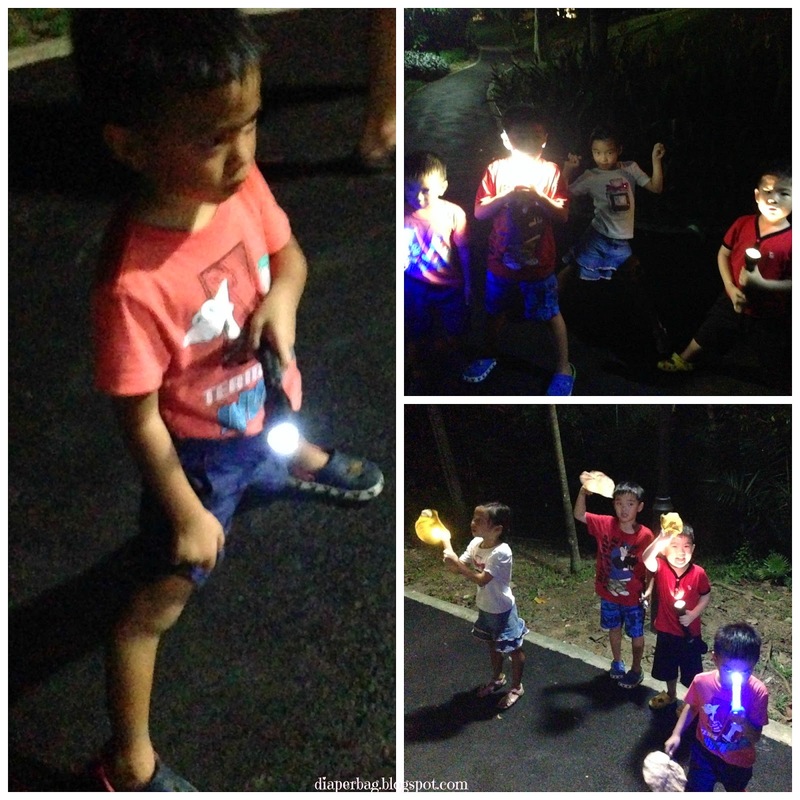 So there were torch lights and light sticks, lots of hooting and 'scary' noises coupled with mosquitoes, humidity and sweat. The adults couldn't wait to get home but the kids wanted to stay out longer and scare each other more. Spooked and hysterically laughing, wanting to stay yet too terrified to do so without their parental escorts. It's easy to always go to Botanic Gardens because it's close by and familiar. But I like trying new things so we ended up at Kent Ridge Park. 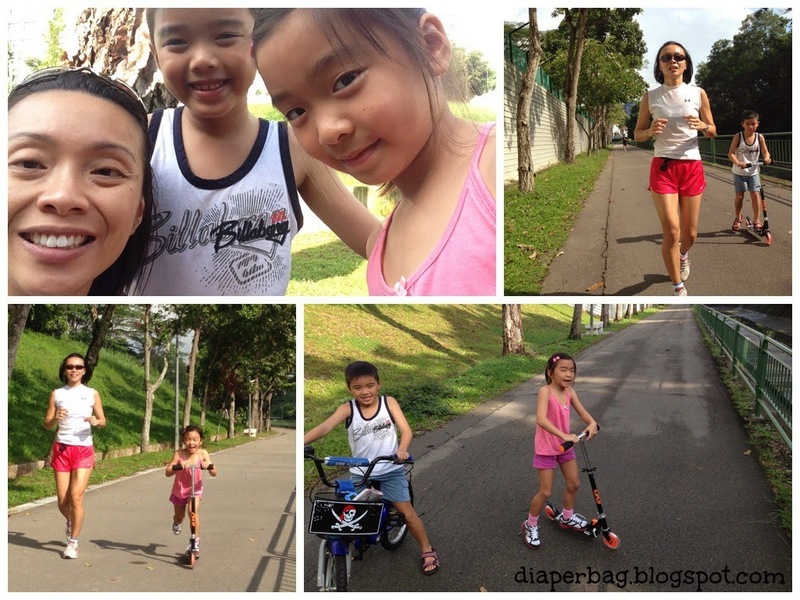 We were aiming for Labrador Park but I think after a particularly bad night with the kids, I really wasn't up to it. We had a nice sense of being engulfed in green there. 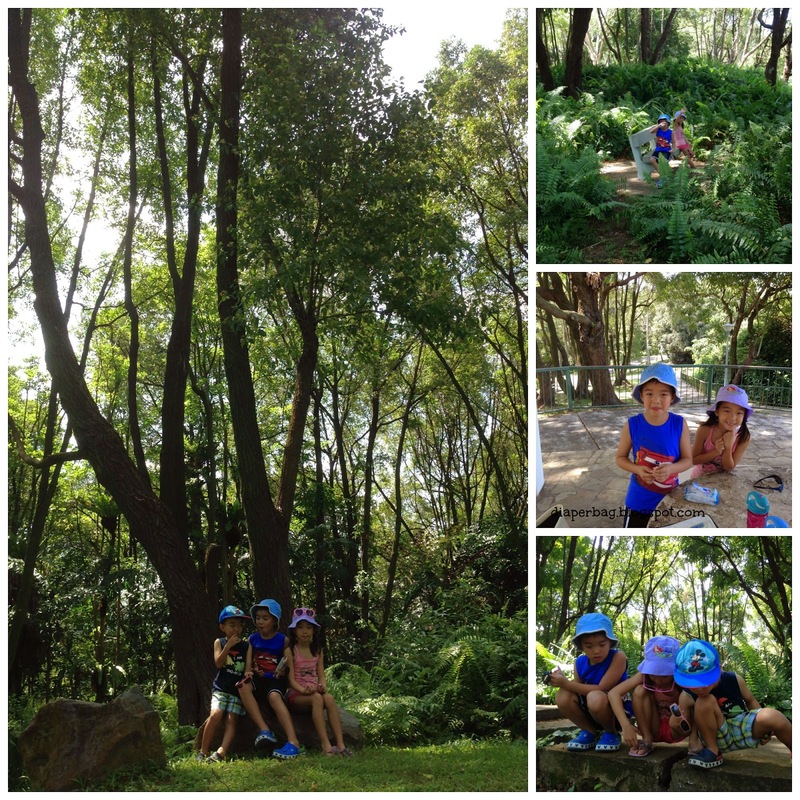 Tall trees, fern brushes that hadn't been trimmed, dwarfing the kids and lots of soil and sand for the kids to muck in. Mosquitoes by the battalions and ants all over the place. So, no, we hadn't been away yet but we did do a couple of new things. We head off to Phuket soon and that'll be a different out of comfort zone experience for them.